Henricopolis Chapter, National Society of the Daughters of the American Revolution (NSDAR or DAR) has been in service to America since February 26, 1927, when it was formed at Glen Allen, Henrico County, Virginia, at the home of Mrs. Alexander McLeod with Mrs. E.W. Finch, State Vice Regent presiding. The choice of a name for the chapter was from the town of Henrico, named for Henry, Prince of Wales, son of King James I. It was founded in 1611 and in this town was built a church, the first college in America, an iron works and sent representatives to the first legislative body in America. It was in Henricopolis that Pocahontas was held captive and taught Christian ways and it was here that she married John Rolfe. Tragedy struck on 22 March 1622 when the Indians massacred almost every person there and destroyed the settlement. 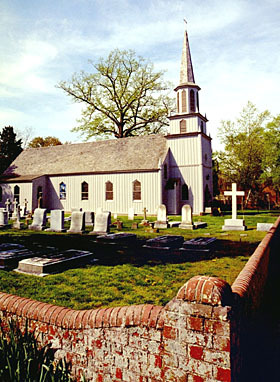 Henricopolis simply dried out after the massacre, and no further attempt to set up an institution of learning was made in Virginia until 1693, when the General Assembly chose Williamsburg for the site of the new institution and the College of William and Mary resulted instead of the University of Henrico. About 1992, the meeting attendance had declined drastically and the decision was to try to have the chapter moved to Tappahannock where most of the active members lived. In 1995, the request of Henricopolis Chapter to be changed (moved) from being a Richmond Chapter NSDAR to a Tappahannock Chapter NSDAR was approved by the National Board in Washington, D.C.
We meet on the third Mondays of September, November, March and May. These are luncheon meetings held in various locations. One meeting a year is often a day trip to an historic site. For information on joining our chapter or the DAR in general, please contact our registrar or chapter Regent at the contact email addresses located in the menu above.